After 36 years of working at the Y, I am excited to announce that I will be leveraging all of the knowledge and skills that I’ve learned to guide the Y on a national level. In February 2015, I will begin my role as the new President and CEO of the YMCA of the USA in Chicago, the national office of the 2,700 YMCAs in the U.S.
As a 10-year-old boy, the Y provided me with a safe place to go where I could be myself and learn from others. The door was always open to anyone. I am proud to say that with all these passing years that the Y’s core values have never wavered, nor has my commitment to youth development, healthy living and social responsibility. To this day, the Y remains a place for all - from campers, to after school children, to members, and staff - to learn and grow. The same way the Y raised me in my youth, it also raised me as professional. I started at the desk, worked my way up to CEO, and never held a job outside of the Ys doors. Exciting things are happening in Boston. I am very proud to have been a part of its growth and honored to have served as the 12th CEO of America’s first Y and build upon its legacy. I am looking forward to seeing the work continue as the 13th CEO steps in to bring the 13 branches of the Greater Boston’s Ys to the next level. The Roxbury YMCA celebrated the life of Dr. King at the 7th Annual Martin Luther King, Jr. Business and Community Breakfast on January 16. At this year’s event, the Y honored two outstanding community leaders. Keeper of the Dream Community Service Award was presented to Mrs. Thelma Burns. This award is presented to someone who celebrates and honors the legacy of the late civil rights leader, Dr. Martin Luther King, Jr. Thelma Burns has been an educator, organizer and activist in the Boston area for over 40 years. Dr. Martin Luther King Jr. Corporate Leadership Award was presented to Mr. Paul Francisco. As Vice President, Diversity Consultant Global Inclusion at State Street Corporation, Paul is an individual that positively affects our community and exhibits the true meaning of corporate citizenship and the legacy of Dr. Martin Luther King, Jr. In addition to the breakfast, the Roxbury YMCA is hosting a day of service on Monday, January 19 in which 100 youth and adults will give back through volunteer projects throughout the community. For more information, please contact Kathryn Saunders. Except for their capes, they seemed like any other runners preparing for the annual Walter’s Run 5K race in West Roxbury on a cold December morning, but on this day this group of Needham girls was preparing for a journey that started three months before. These girls were participating in the Charles River YMCA’s inaugural session of Girls on the Run – a national running program for girls in grades 3 – 8 designed to build confidence and self-esteem while preparing girls to run a 5K. 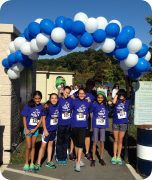 The Charles River Y’s long-term goal is to expand the program reaching the maximum of 20 youth each year and create a greater community of young runners who provide positive role models for each other in the community. The Charles River YMCA is actively recruiting girls for its second session. To learn more, contact Liz Gregg. On a recent Saturday morning, 17 Egleston Square teens boarded vans outside the YMCA heading to the Berkshires for a weekend retreat. Over the summer, two neighborhood youth fell victim to gun violence, losing their lives. Following the tragic events, Y teens made a pledge to find ways to engage disengaged youth in the community and support the victims’ families. Once in the Berkshires, the 17 youth led by YMCA staff members discussed the violence in their community and how they could facilitate positive change. Their goal was to develop at least one action step they could take in 2015 to make their community better. They ended the weekend with a plan for an art show that would raise funds for the families of the two young men murdered but also with a larger sense of responsibility to themselves, each other and their community. The Egleston Square YMCA provides over 200 youth each year with a safe space away from the streets and its violence. For some, the influence from gang life is too much for the Y to compete with but for most, they find a path to a better life enrolling in college preparation programs, finding employment opportunities and caring consistent adult mentors. 1. Eat Healthy: Make water your drink of choice (supplemented by age-appropriate portions of 100 percent fruit juices and low-fat milk) and eat more fruits and vegetables. Keep it interesting and create some variety by mixing and matching fresh, frozen and canned fruits and vegetables. 2. Commit to Community Service: Giving back and supporting neighbors can benefit everyone involved. Not only is it a personally rewarding experience to help others in need, but it’s also a way to meet new people or discover an interest. Find an opportunity in your community, such as cleaning the neighborhood park or distributing food at a local food bank. 3. Unplug from Technology: Limit screen time (television, video games, computer, etc.) and instead set aside an hour or two for activities. If weather permits, go for a walk, bike ride, trip to the park, or have a game night at home with family or friends. 4. Be Physically Active: It’s important for children to get at least 60 minutes of physical activity each day (30 minutes for adults). Incorporate physical activity into your daily routines and spend more time walking to places instead of driving to improve your health and well-being. 5. Put Extras to Good Use: Do you have extra canned goods or clothes that could benefit others in need? Clean out your pantry, closet or attic and donate extra items to homeless shelters or community outreach programs. 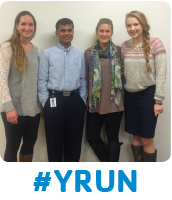 The YMCA of Greater Boston is pleased to announce its 2015 Boston Marathon Team. Each of these four amateur athletes have agreed to raise a minimum of $7,500 to support YMCA teen programs across Greater Boston. Support our amazing team members here. Already registered for the Boston marathon? Contact us to learn how you can join our team.